The UK's Society of Motor Manufacturers and Traders (SMMT) predicted a grim 2009 with sales expected to fall by a fifth to 1.72 million after an 11 percent drop last year. 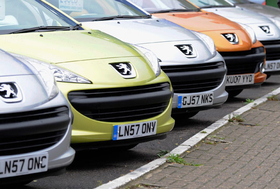 The January decline to 112,087 units was the worst performance for UK car sales for that month since 1974. SMMT CEO Paul Everitt said the British government should introduce incentives such as a scrappage bonus to boost demand. "A number of EU member states have launched scrappage incentive schemes, which boost consumer confidence and deliver significant environmental benefits," Everitt said. Under scrappage schemes, governments offer consumers cash incentives to exchange old cars for new models. The SMMT said scrappage schemes could increase 2009 new-car sales in France by an estimated 220,000 and by 400,000 in Germany. Car sales in Germany fell 14 percent in January. In France, sales were down 7.9 percent while Spanish car sales fell by 41.6 percent. In Italy, sales declined almost 33 percent.